Growing up in Merrimack, New Hampshire, Chris Burns’ life revolved around basketball. He’d played it since age 6, and loved the team camaraderie, individuality, creativity and freedom of the sport. But then he was cut from his middle school team. Just 4-feet-11-inches in ninth grade, he scrapped his way onto the freshman squad. Then he grew – “like a foot” – over the summer. “Everything came together for me,” he recalls. He made the Providence College team, then transferred to and played at nearby Bryant University. After graduation Burns played for Albany of the Continental Basketball Association, then semi-pro around the Northeast. When his playing days were over, he wanted to stay in the game. 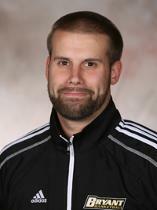 In 2009 he joined the Rhode Island College staff as an assistant coach. Today he’s in his fourth year as an assistant at Bryant, his alma mater. So far, a fairly typical story. But Burns is a bit different from any other Division I men’s basketball coach: He is the only one who is openly gay. His first realization that he might be gay came as a sophomore or junior in high school. Like many athletes, he had a tough time reconciling his feelings with his self-image. “I had never been physical with a guy. I dated a cheerleader. But when I was by myself, I knew who I was attracted to,” Burns recalls. At the end of high school, Burns met Anthony Nicodemo, a high school basketball coach in New York. Though living nearly 200 miles apart, they found ways to spend time together. Their relationship was strong and deep – and closeted. For several years, no one knew their secret. The two men did not use the “g”-word, even with themselves. “We talked about being the best man at each other’s wedding,” Burns says. Eventually, Burns began venturing out. He and Nicodemo went to gay bars in New York. They made gay friends. Both became more comfortable in their own skins. His first steps out of the closet were risky. At first, he simply stopped worrying about what he said. Then he realized he had to do more. He told family members and non-basketball friends. So – even though the comment had been made from a position of caring – Burns’ coming-out process stalled. For a year and a half, he stayed in a self-imposed basketball closet. Two months ago, Burns decided to take the leap. He told the other Bryant coaches, then the Bulldogs’ three captains. He told them he might have to quit. “No! We need you here!” they said. And that was that. Burns told the rest of the team shortly thereafter. There were hugs and heartfelt comments. No one said a negative word. He’s treated the same as before. In fact, Burns says, some bonds are even stronger. He hangs out in the same locker room he knew as a player. It’s a comfortable place for everyone. One thing has changed: Burns takes time every day to plow through the “ridiculous amount” of emails, texts, even letters he’s received. They’ve come from conference rivals, other basketball players and coaches, plus young kids and 70-year-olds he’s never met. All say how proud they are of him. “Everyone has this idea that sports people are close-minded,” Burns says. “That idea is as outdated as the one that homosexuality should be demonized. Sports people have evolved as much as everyone.